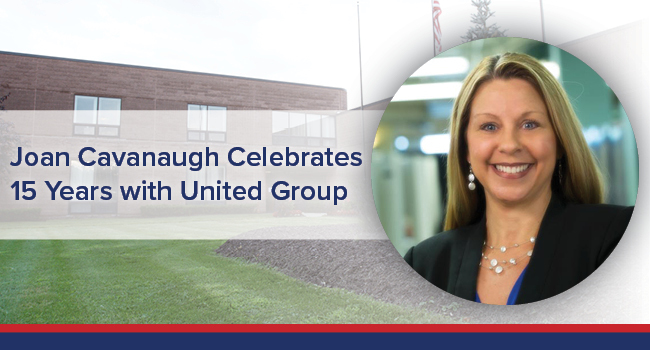 January 2018 marks Joan Cavanaugh’s fifteenth year with United Group! Joan proudly leads the Human Resources Division, overseeing more than 200 employees, managing recruitment and talent acquisitions, and employee relations and development. Joan also plays a valuable role integrating business strategy and planning, as well as effectively translating business plans into operational human resource programming. The United Group is truly thankful for Joan’s commitment to creating a positive and healthy work environment for every employee. Thank you for your dedication, Joan! Learn more about Joan’s exciting fifteen years with United Group below. Everyone was friendly and welcoming and a breakfast was arranged for me to meet the staff at the Corporate office. I was so nervous I couldn’t eat, but I quickly felt at ease with the camaraderie and hardy laughter that was displayed. It was a very much “figure it out as you go” kind of day with a lot of reading and trying to understand the lay of the land. I ended my first day with a “thank you email” to everyone for their generosity and time. It had a typo from reworking the message, I recalled it after the majority of people read it, and then inadvertently sent out the original email again! Mortified, I felt that I was “pre-disastered” and my second day could only get better – and it did. I began at United Group as Director of Human Resources and was promoted to Vice President of Human Resources in the fall of 2007. I am in the same role now, however, when we were affected by the down turn of the economy, some positions were consolidated and I began to oversee office operations. After exchanging “pleasantries” through the window with a smiling grey haired man, along with all the birds and squirrels he feeds daily, my day officially begins! After that, the most enjoyable part of my day happens. I have the luxury of having an office on the second floor, last office on the right after traveling down a long hallway, so I have the privilege to greet and interact with a lot of people at the start my day. Each day is different in HR and the time of year definitely plays a part with regard to what’s going on. Philanthropic activities, recruitment cycles, insurance renewals, compliance requirements, employee relations activities, performance evaluations, etc. The beauty of a centralized HR office is having interaction with almost everyone in the company at one time or another. It’s very rewarding to see individuals advance in their careers, see families grow, and see appreciation in individuals for us doing things we enjoy for them! I work with a beautiful group of people who are incredibly talented and resourceful. On a more serious note, Michael Uccellini had asked if I would be an “owners rep” with regard to the design elements for Hearthstone Village. It was an honor and privilege to work with Marketing and Construction on a project that fell outside of my scope and function, and provided me with an awesome opportunity to work directly with other teams and to learn how a building went from a structure, to a structure with design and purpose. I didn’t understand all aspects of the construction and design process, but Michael knew it would provide me with an understanding of our Company from the ground up (no pun intended!). While at United Group, I got married, had two children Grayson (now 13) and Ava (now 10), have been promoted, celebrated anniversaries, and shared many happy experiences with a lot of people I respect and admire. All of those events were celebrated in some fashion throughout my time with United Group and I’m grateful for each and every memory that has been created. 5. )What do you love most about the United Group? I truly love the diversity of people we employ. There are people here with years of experience and some that are just starting out in their careers. I don’t just learn one new thing a day, I learn a lot of things from a lot of different people almost every day. There is a lot of sage advice from more senior staffers and a lot of new ways of “thinking and doing” from individuals who are newer to the workforce. This organization has opportunities for individuals at all levels – it’s the knowledge, skill and ability that gets them in the door, it’s the passion, perseverance, and desire for achievement that keeps them here. 6. )What advice do you want to give yourself now, after working for the United Group for past 15 years? Dare to be different, don’t worry about the decisions you make, as long as you have the company’s and the employee’s best interests in mind. Even when decisions are unpopular, challenging, or cause disagreement, if it’s the right thing to do, then do it – but do it gracefully and with purpose.